18 • March 2018 • S I G N & D I G I T A L G R A P H I C S ELECTRIC SIGNAGE A t 37, Joey Gerhart has already been bending neon for almost 20 years. That's in a trade that some people in the sign business might think—like hand lettering—is no longer sustainable or relevant. But Gerhart is part of a community of tube benders scattered around the U.S. who know better. Gerhart started this tube-bending career path at the Birmingham, Alabama-based wholesaler, Sign Builders Inc., in 1999, right out of high school. It was about the same time that LEDs were first intro- duced as a light source for signs, but most channel letters and cabinet signs were still being lit with either neon or fluorescent lamps. It was supposed to just be a summer job to appease his father who insisted, since he decided not to join the Navy, "You have to find a job until you figure out what you're going to do." It happened that a friend's brother, who worked at SBI, said they were always hiring. So Gerhart and his friend got themselves hired on. "They threw me into the neon shop as a helper," he remembers. N E O N S H O P T O U R B Y E D D I E W I E B E R A L L I M A G E S B Y E D D I E W I E B E R Eddie Wieber reports on market affairs and busi- ness trends for National Business Media and its several publications serving the graphics and automotive industries. 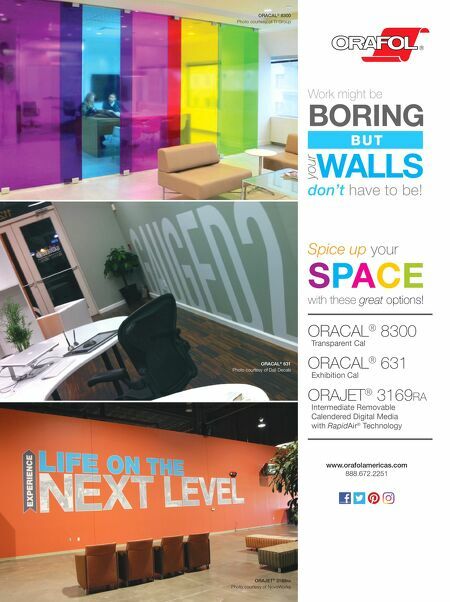 He is a former editor of Sign Business magazine. 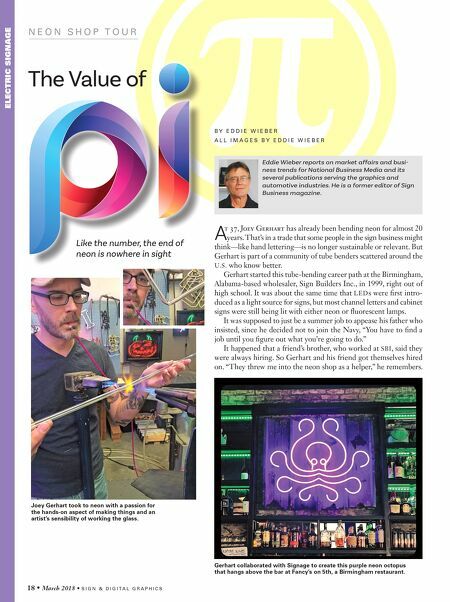 The Value of Like the number, the end of neon is nowhere in sight Joey Gerhart took to neon with a passion for the hands-on aspect of making things and an artist's sensibility of working the glass. Gerhart collaborated with Signage to create this purple neon octopus that hangs above the bar at Fancy's on 5th, a Birmingham restaurant.